Welsh and Cornish folklore also both place great importance on the bird. The Cornish believe that the spirit of King Arthur now resides in a raven, making it deeply unlucky to injure or kill any of these birds. The Welsh have a story, recounted by Geoffrey of Monmouth, that when the giant king (also identified as a ‘raven god’ in some accounts) Bran the Blessed (from the Welsh, ‘bran’ translates as ‘raven’) died, his head was buried at a site usually identified as Tower Hill in London. As long as the king’s head remained buried there, it is said that Britain would be safe from invasion. 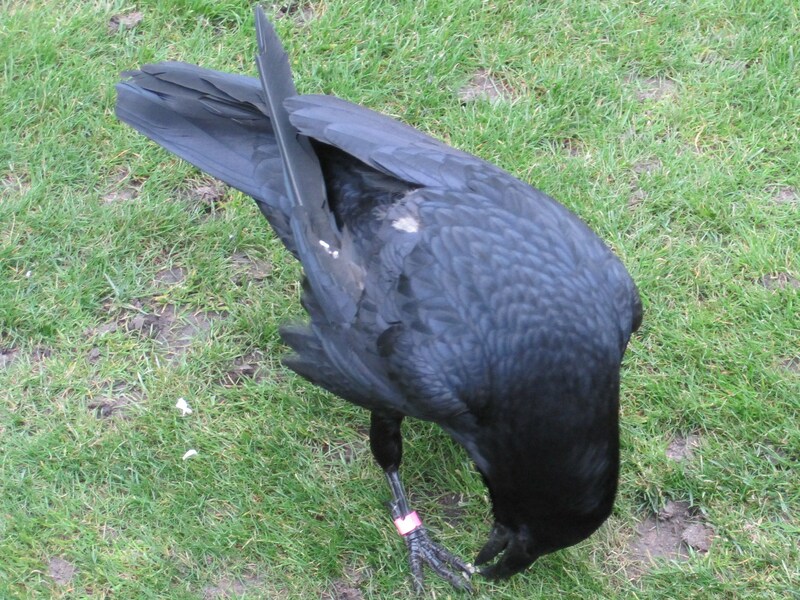 Stories like these irresistibly connect to the most famous British ravens of them all – the corvid residents of the Tower of London. Recently, I got the chance to visit the Tower and have a closer look at these remarkable, long-lived and highly intelligent birds (see photos). Having never seen a raven in the wild, the first thing that struck me was how large they are – and how noisy! There are currently seven of these talkative birds resident at the Tower (the traditional six – see below – plus one in reserve), and, despite the fact that they all have their flight feathers clipped to prevent escape, they do seem to enjoy hopping about and playing up to their apparently ancient reputation for the thousands of tourists who visit every year. However, their presence at the Tower may not be as ancient as legend suggests. 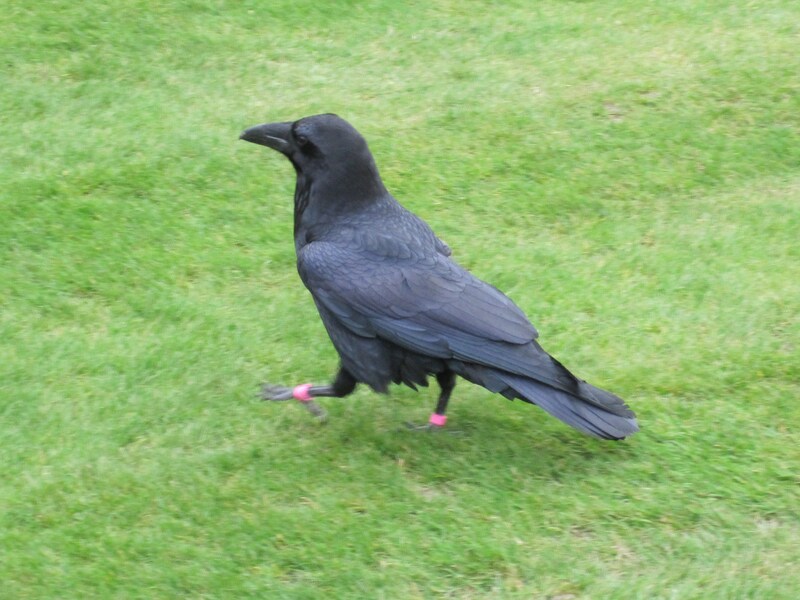 It seems that there have probably been wild ravens at the Tower for centuries, possibly as far back as at least the 13th century, but the earliest documentary evidence for their domesticated presence only dates back to the mid to late 19th century. There is a long-standing legend that the birds have been protected by royal decree for at least the last four hundred years (it is certainly true that wild ravens are now very rare in many areas, and are a protected species under modern British law), after a curious incident during the reign of Charles II. The story goes that the king decided to establish a Royal Observatory, installing the Royal Astronomer, John Flamsteed, in a turret of the White Tower. Flamsteed soon complained to the king that the resident ravens were getting in his way and disrupting his experiments, so the king issued a decree that the birds were to be culled. But before this could be carried out, a soothsayer contacted the king with a chilling message. Charles was told in no uncertain terms that if all the ravens left the Tower, it would collapse and a great and terrible catastrophe would befall his kingdom. Being the son of the executed Charles I and having nearly lost his kingdom during the Civil Wars, Charles didn’t need telling twice. He is said to have then decreed that there should always be (and still are) at least six ravens at the Tower at any given time to prevent this fate, and promptly moved Flamsteed and all his kit down river to Greenwich (where the Royal Observatory remains to this day). However, modern research has shown that this pleasingly apocalyptic tale is probably a romantic Victorian reinvention of the Bran myths; a tale created during a period where the idea of the raven was beginning to take on more of a distinctly ominous overtone in art and literature as well as in mythology. After the success of Poe’s poem in particular, there was a typically Victorian craze for pet ravens, and the first corvid residents of the Tower as we know them now may have actually been the pets of 19th century Yeoman Warders or other members of Tower staff, a theory which weakens the foundations of the tale of the raven prophecy. The closest the Tower has come to losing all its ravens and fulfilling the ‘prophecy’ was in 1944, a dark period when all the birds bar one (a raven named Grip) had been killed by bombing or had died of shock during the London Blitz – during which the Tower had been at the centre of the docklands area particularly targeted by the Luftwaffe and had suffered its fair share of bomb damage. However, by the time the Tower re-opened in 1946, five new ravens had been enlisted as companions for poor lonely Grip. Parts of this post were originally published on my old blog in October 2008 and are reproduced here with a few minor edits and some updated additions. The raven photos are more recent, having been taken on my visit to the Tower of London last month (you can find more of my photos from the Tower here). For more on the other creatures who have inhabited this urban fortress at various points during London’s history, see here.